The purpose of this study was to investigate the differences of the 6-week grab start technical training on the grab start kinematics of swimmers in boys and girls who attend secondary school and participate regularly in training and competitions. The study group was composed of 7 girls and (Xage = 13.25 ± 0.50years, Xheight = 157.25 ± 2.21cm, Xbodyweight = 50± 10.13kg), 8 boys (Xage = 14.5 ± 0.57years, Xheight = 167.5 ± 6.19cm; Xbodyweight = 64 ± 6.68kg) who voluntarily participated in the study. In addition to the training programs, the swimmers trained twice a week for six weeks. The grab start performances of the swimmers were recorded with high speed cameras and the obtained images were digitized with the analysis program(SIMI MOTION 7.3, GER). Mann Whitney U test was used to determine the differences between the groups. According to results of statistical analysis, there was no statistically significant difference between male and female swimming groups’ displacement and angle parameters. This may be because of the difference of preferred start techniques of the swimmers, inefficient the training content and / or duration to develop their grab start performance or the age group of the study was not adequate to have significant development. In this respect, it is recommended that the coaches may choose the study group amongst the swimmers using the start technique and the content and duration of the training may be optimized according to the anticipated performance development. Bu çalışmanın amacı; orta öğretimde öğrenim gören ve düzenli antrenman yapıp müsabakalara katılan kız ve erkek öğrencilerde, 6 haftalık grab çıkışı teknik antrenmanlarının yüzücülerin grab çıkış kinematiği üzerine farklarının incelenmesidir. Araştırma grubu, çalışmaya gönüllü olarak katılan ve ortaöğretimde eğitim gören 7’si kız (XYaş = 13.25±0.50yıl; XBoy = 157.25±2.21cm; XVücutAğırlığı = 50±10.13kg), 8’i erkek (XYaş = 14.5 ±0.57yıl; XBoy = 167.5±6.19cm; XVücutAğırlığı = 64±6.68kg) toplam 15 yüzücüden oluşmuştur. Yüzücüler, antrenman programlarına ek olarak, altı hafta süresince haftada iki kere teknik antrenman yapmışlardır. Yüzücülerin çıkış performansları yüksek hızlı kameralarla kayıt altına alınmış ve elde edilen görüntüler hareket analizi programı(SIMI MOTION 7.3,GER) ile sayısallaştırılmıştır. Verilerin analizinde, gruplar arası farkın belirlenmesi için Mann Whitney U testi kullanılmıştır. Değerlendirilen yer değiştirme ve açısal değişim kinematik parametreleri arasında kız ve erkek yüzücüler arasında istatistiksel olarak anlamlı bir fark bulunmamıştır. Bunun sebebi, yüzücülerin farklı bir çıkış tekniğini kullanıyor olmaları, uygulanan antrenman içeriği ve/veya süresinin sporcuların grab çıkış performanslarının gelişimleri için yeterli olmaması veya yaş grubuna uygun olmaması olabilir. Bu doğrultuda, antrenörlerin çalışmaya dâhil olacak yüzücüleri değerlendirilecek çıkış tekniğini kullanan yüzücüler arasından seçilmesine dikkat etmesi, antrenmanın içeriğinin ve süresinin gelişim beklenen özelliğe göre optimize edilmesi önerilmektedir. Ayalon, A., Van Gheluwe, B., & Kanitz, M. (1975). A comparison of four styles of racing start in swimming. Swimming II: Proceedings of the Second International Symposium on Biomechanics in Swimming (pp. 233-240), Brussels, Belgium. Blanksby, B., Nicholson, L., & Elliott, B. (2002). Biomechanical analysis of the grab, track and handles starts, Sports Biomechanics, 1(1), 11-24. Bishop, D., Smith, R., Smith, M., & Rigby, H. (2009). Effect of plyometric training on swimming block start performance in adolescents. Journal of Strength and Conditioning Research, 23(7), 2137-214. Breed, R., & Young, W. (2003). The effect of a resistance training programme on the grab, track and swing starts in swimming. Journal of Sports Sciences, 21(3), 213-220. Bozdoğan A. (2005).Yüzme.İstanbul: Morpa Kültür Yayınevi. Clauser, J. F., Horne, M. A., Shimony, A., & Holt, R. A. (1969). Proposed experiment to test local hidden-variable theories. Physical Review Letters, 23(15), 880. De la Fuentes, B., Garcia, F., & Arellano, R. (2003). Are the forces applied in the vertical countermovement jump related to the forces applied during swimming start? In: Biomechanics and Medicine in Swimming IX. Ed: Chatard, J. Saint Etienne(pp. 99-103) University of Saint Etienne. Guimares, A.C.S., & J.G Hay. (1985). A mechanical analysis of the grab starting technique in swimming. International Journal of Sport. Bioline Chanics, 1(1), 25-35. Harrison, G.G., Buskirk, E.R., & Carter J.E. (1988). Skinfold thicknesses and measurement technique. (Eds) Lohman, T.G., Roche, A.F. ve Marorell, R., Anthropometric standardization reference manual. Illinois: Human Kinetics Books. Issurin, V., & Verbitsky, O. (2003) Track start vs grab start: evidence from the sydney olympic games. In: Biomechanics and Medicine in Swimming IX. Ed: Chatard, J. Saint Etienne: Université de Saint Etienne. 213-217. Jackson, K.M. (1979). Fitting of mathematical functions to biomechanical data. IEEE Transactions in Biomedical Engineering, BME-26(2), 122-124. Krüger, T., Wick, D., Holmann, A., EL-Bahraw, M., & Koth, A. (2003). Biomechanics of the grab and track start technique. In: Biomechanics and Medicine in Swimming IX. Ed: Chatard, J. Saint Etienne: University of Saint Etienne. 219-223. Lee, C., Huang, C., Wang, L., & Lin, D. (2001) Comparison of the dynamics of the swimming grab start, squat jump, and countermovement jump of the lower extremity. In: XIXth International Symposium on Biomechanics in Sporst(pp. 243-246) San Francisco. Miller, M., Allen, D., & Pein, R. (2003). A kinetic and kinematic comparaison of the grab and track starts in swimming. . In IXth World Symposium on Biomechanics and Medicine in Swimming. Saint Etienne: University of Saint Etienne (231-235). Saint-Étienne, France. Slawson, S. E., Conway, P. P., Cossor, J., Chakravorti, N., Le-Sage, T., & West, A. A. (2011). The effect of start block configuration and swimmer kinematics on starting performance in elite swimmers using the Omega OSB11 block. Procedia Engineering, 13, 141-147. Vantorre, J., Chollet, D., & Seifert, L. (2014). Biomechanical Analysis of the Swim-Start: A Review. Journal of Sports Science & Medicine, 13(2), 223–231. Vilas-Boas, J. P., Cruz, J., Sousa, F., Conceicao, F., Fernandes, R., & Carvalho, J. (2003). Biomechanical analysis of ventral swimming starts: comparison of the grab start with two track-start techniques. In IXth World Symposium on Biomechanics and Medicine in Swimming. Saint Etienne: University of Saint Etienne (pp. 249-253). Saint-Étienne, France. ISNAD GÜNGÖR, Özlem , Alptekin, Ahmet , Okur, Abdullah Ünal . "6 Haftalık Grab Çıkış Tekniği Antrenmanının Çıkış Kinematiği Üzerine Etkisi". 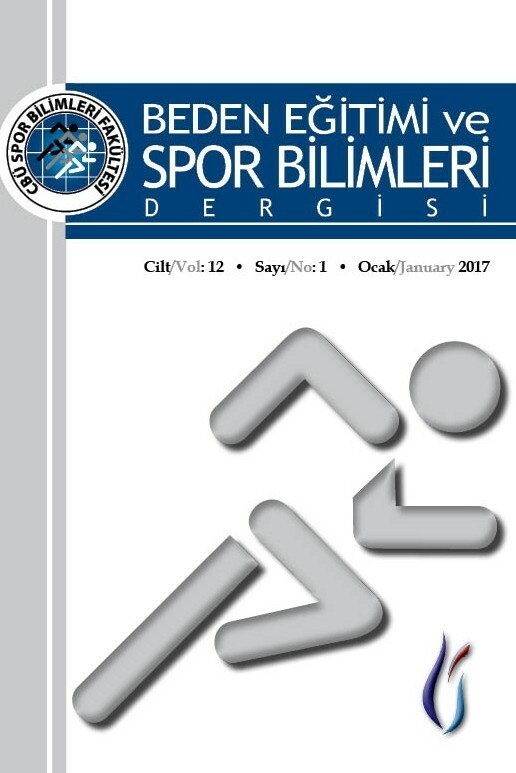 CBÜ Beden Eğitimi ve Spor Bilimleri Dergisi 12 / 2 (December 2017): 128-135.